One of the most vital resources to our planet is water. With an ever rising population, it is essential that we monitor water quality in the environment so that we can detect changes and take action as needed. This post will discuss key water quality measurements and how to calibrate in the field for the best results. Water quality is a measure of water's suitability to be used for a specific purpose, such as swimming, farming, or power generation. Water that is considered unsuitable for one application may be perfectly acceptable for another purpose. Quality is a statement of the physical, biological, and chemical characteristics of water based on key conditions. These conditions can vary by location, such as at different points in a river or by time depending on the climate. Surface water and ground water can also affect the quality of each other, since these two are connected at the water table. It is important to recognize that water quality can be adversely impacted by both natural and man-made factors. Regularly monitoring water sources can help identify potential issues before they cause serious harm. Calibration is an essential step to getting accurate and repeatable results. Ideally, you should calibrate your testing equipment prior to use on the day of sampling. A post calibration check at the end of the day can be performed to determine if the instrument drifted out of calibration. Depending on the nature of your project, you may need to perform more frequent calibration checks throughout the day in addition to the check at the end of the day. Remember to only use fresh standards and clean probes as debris could adversely affect your results. What are key water quality testing parameters? There are a number of parameters that can be measured to indicate water quality. These parameters can be a measure of physical characteristics such as pH, conductivity, or temperature; a statement of the levels of various nutrients in water, such as nitrates and phosphates; or an indication of key elements and compounds in water, such as dissolved oxygen. Each parameter has some general standards and guidelines for determining if a tested sample should be considered acceptable or hazardous. The results of these tests are not necessarily absolute, since they must be compared in relation to what is considered normal levels for a body of water. pH is a measurement of the relative concentration of hydrogen ions and hydroxide ions in water. The scale ranges from 0 to 14, with 0 being a strong acidic solution and 14 being strongly basic. Why is measuring pH important? pH is a way to evaluate the suitability of water for living plant and animal organisms. If water has become too acidic or basic due to natural or man-made pollutants, there can be a profound negative impact on aquatic life. pH is considered normal in a body of water if it has a value of 5.0 to 9.0, but ideally it would fall in the range of 6.0 to 8.0. How do we measure pH? Common pH tests, like chemical test kits and pH strips, are simple and inexpensive. However, they come with some issues that could lead to inaccurate results. Both of these methods of testing pH give you results based on a chemical reaction that results in a color change. When your paper or liquid sample changes color, you match it to the color guide provided and get your pH reading. A more accurate means of testing pH is using a pH meter. When choosing a pH tester or meter, there are a number of considerations related to both the electrode as well as the device. Be sure the find a pH meter and electrode that is best suited for field work. The first thing is to choose the buffer solutions that will bracket your expected value. What is bracketing? Also known as a two-point or multi-point calibration, bracketing consists of calibrating to two pH points – one above and one below your desired pH range. For example, if you want to measure the pH of lemon juice, which has a pH around 2, you could use technical buffers 1.00 and 4.01 for a two-point calibration. If the pH of your water sample is unknown, then a third calibration point will ensure the best accuracy. Fill a beaker with enough pH calibration buffer to cover the electrode junction (about 75 mL in a 100 mL beaker). Place the electrode in the beaker containing pH calibration buffer and gently stir. Confirm the calibration point when the reading is stable, or when the digits do not change for at least 5 seconds. Repeat for additional calibration points. Be sure to rinse with pure water between calibration points. At least two calibration points are recommended. The calibration is complete. Rinse the probe with deionized water and store the probe according to manufacturer’s instructions. Check out our full pH Measurement SOP. Temperature is one of the most common measurements in our everyday life. In the context of water quality, temperature can provide an indication of the living conditions for aquatic plants and animals. Warm temperatures are generally considered beneficial for growth of aquatic populations. However, after a certain point temperature can have the opposite effect, contributing to a decline in the biological diversity in a water body. Why is measuring temperature important? Aquatic organisms such as fish and plankton are cold-blooded, so the temperature of water has a direct impact on their body temperature. These organisms have ranges of temperature in which they can survive, or thrive. As the temperature reaches the high limit of its range for an organism, biological activity will be at a peak. This activity will decrease at the bottom of the range. If the temperature exceeds the acceptable range for an organism, the available supply of oxygen may be too low to sustain life. This is because warm water has an oxygen saturation point much lower than cold water. If temperature is below the acceptable range, not enough activity takes place to grow the species. High temperatures also contribute to the growth of algal blooms. Oxygen is consumed as these blooms are decomposed by bacteria, thus reducing the available dissolved oxygen supply. Temperature in a water body varies based on the time of day and the amount of sunlight heating the surface of the water. Acceptable temperatures also vary depending on the type of river or stream being monitored. This depends on the watershed feeding the stream. If the stream is fed by a mountain spring, for example, the natural temperature of the stream may be quite cool (less than 68 degrees F). A stream that is considered warm water will have an average temperature greater than 68 degrees F but less than 89 degrees F. Temperature can also be influenced by the flow rate of a body of water. If the flow of water is increased, perhaps as a result of a heavy rainfall, the temperature can be expected to decrease. The increased current has a cooling effect on the temperature of the water. Temperature pollution, also called thermal pollution, can be caused by runoff of water heated on asphalt or concrete. It can also be from industrial effluents being discharged into the water body, or water that was used as a coolant in nuclear power plants. This water is significantly hotter than the water into which it is discharged, which can raise the overall temperature of the water body. Temperature can also be linked to turbidity. Since the amount of light absorbed increases as the water darkens, the temperature will increase. How do we measure temperature? Many simple thermometers use thermistor technology. The thermistor is a semiconductor device whose resistance varies as a function of temperature. As the temperature rises, the resistance decreases. This resistance measured by the thermistor is then converted to a value displayed on the Celsius or Fahrenheit scale. Thermistor sensors are suitable for a temperature range of -50° to 150° C (-58° to 302° F). Many meters are factory calibrated for temperature readings. It is good practice to check at least once a year, in a laboratory setting, that your temperature sensor is working properly. Electrical conductivity (EC) measures how well a substance can transmit an electrical current. Small charged particles, called ions, help to carry the electrical charge through a substance. These ions can be positively or negatively charged. The more ions available, the higher the conductivity; fewer ions would result in lower conductivity. EC is typically reported in milliSiemans per centimeter (mS/cm). Total dissolved solids (TDS) is the amount of dissolved substances in solution. This measurement reads all the dissolved inorganic and organic substances in a liquid. Results from this reading are displayed as milligrams per liter (mg/L), parts per million (ppm), grams per liter (g/L), or parts per thousand (ppt). Why is measuring conductivity important? Electrical conductivity (EC) is another way to evaluate water quality, since the increased presence of total dissolved solids (TDS), as expressed by EC, may be an indicator of pollutants. EC can be impacted by carbonates from limestone, man-made point source pollutants such as sewage treatment plants, or man-made non-point source pollutants such as septic systems or agricultural runoff. High concentrations of TDS can lower water quality and cause water balance problems for individual organisms. On the other hand, low concentrations may limit the growth of aquatic life. Some of the effects discussed for the acidity and carbon dioxide parameters have relevance for EC, such as its negative impact on photosynthesis. This is because increased solids make water murkier, which slows down the rate of photosynthesis. EC provides an indication of total dissolved solids, of which total dissolved salts are a component. If the level of salts in TDS is high, this could also contribute to the acidity of the water. However, if the level of carbonates in TDS is high, this could contribute to an increase in alkalinity, which helps protect against acidity changes. This is a good example of the interrelationships between water quality parameters. Acceptable levels of EC in rivers and streams vary depending on the type of dissolved solids present and this determines the use of the stream, such as for fishing, swimming, or as a source of drinking water. The combination between TDS and Total Solids is important to understand. Total Solids refers to all solid matter that is either suspended or dissolved in water. Dissolved Solids are not visible in water, since through being dissolved they have become part of the solution. TDS is the measurement of the water-soluble substances that are in a water sample. In a sample solution collected from a river, these dissolved substances are called solutes, and water is called the solvent. How do we measure conductivity? The best way to measure conductivity in with the use of an EC meter. Two electrodes with an applied AC voltage are placed in the solution. This creates a current dependent upon the conductive nature of the solution. The meter reads this current and displays in either conductivity (EC) or ppm (TDS). It is important to calibrate for conductivity before sample. This is because oily coatings and biological contaminants can actually change the apparent cell geometry, resulting in a shift in cell constant. Before performing a conductivity calibration, always inspect the EC sensor for debris or blockages. Most meters are calibrated against a single standard which is near the specific conductance of the environmental sample. A second standard can be used to check the linearity of the instrument in the range of measurements. Fill a beaker with enough standard to cover the electrode junction (about 75 mL in a 100 mL beaker). Pour additional standard into a second beaker to be used to rinse the sensor. Place the electrode into the rinse beaker and ensure that the EC sensor channels are filled with fresh standard by raising and lowering the beaker a few times. Place the probe into the calibration beaker and tap to dislodge any trapped bubbles. Confirm the calibration point when the reading is stable, or when the digits do not change for at least 5 seconds. (Some meters require you to enter the conductivity standard value). The concentration of dissolved oxygen (DO) in water is extremely important in nature as well as in man’s environment. In the oceans, lakes, rivers, and other surface water bodies, dissolved oxygen is essential to the growth and development of aquatic life. Without oxygen, the water can become toxic due to the anaerobic decaying of organic matter. In an industrial environment, water must contain at least 2 mg/L of oxygen to protect water pipes from corrosion. However, boiler system water, in many cases, cannot contain greater than 10 mg/L of oxygen. Why is dissolved oxygen important? DO levels can help indicate the relative health of a water body. If DO levels are normal or high, the water is a good environment for a variety of aquatic life to flourish. If DO levels are low, it may indicate the presence of pollutants in the water. Some aquatic life can exist in water with a wide range of DO, but others cannot survive in a low DO environment. animals in the water consume oxygen through respiration, but not as much oxygen is produced at the same time. As a result, DO levels in early morning are lower compared to other times of day. Once photosynthesis begins, DO levels will rise. This is a good example of the benefits of measuring parameters at various times throughout the day. If only a pre-dawn DO measurement is taken, an inaccurate conclusion may be drawn regarding the healthiness of the water. While DO levels are partially influenced by photosynthetic activity, a large source of DO is from atmospheric oxygen mixing with water. This happens in larger amounts if the water is turbulent. The turbulence increases the surface area of the water, so atmospheric oxygen can mix with it more easily. Air has an oxygen concentration that is over 20 times higher than oxygen concentration in water. This concentration difference results in atmospheric oxygen dissolving in water when the two meet. If there is more water surface at this interface, then more oxygen from the air will be absorbed. Other factors that influence DO levels are temperature and runoff water. Oxygen dissolves more easily in cold water, and cold water has the ability to hold larger levels of gases than warm water, so the DO level decreases as the water gets warmer. Runoff can include natural organic wastes or man-made pollutants; in both cases, organisms in the water must use oxygen in the process of decomposing these pollutants. Also, organic wastes can lead to growth of aquatic vegetation. When plants die at the end of the growing season, heavy oxygen consumption takes place as they are decomposed. How do we measure Dissolved Oxygen? Dissolved oxygen concentrations are most often reported in units of milligrams of gas per liter of water, mg/L. (The unit mg/L is equivalent to parts per million = ppm). Measurements are usually taken in water using a DO probe and meter. It is important to measure DO levels at various times of the day, and at various water depths. These measurements will give an overall picture of the DO levels in the water body being investigated. As with all water quality parameters, these levels must be monitored over time. This will yield a quantity of data points so trends can be identified and evaluated. Dissolved oxygen (DO) content in water is measured using an electrode with a membrane. Unfortunately, brushes or other cleaning objects may damage the membrane so replacing the membrane cap and electrolyte is the best way to perform periodic maintenance. Although it may be easier to calibrate the D.O. sensor prior to going out in the field, it is best to calibrate at your sampling site because differences altitude and barometric pressure between the calibration and measurement site can result in errors. Be sure to verify that the barometric pressure, conductivity, and temperature readings are correct. Fill a calibration beaker with water (alternatively, a wet sponge or a wet paper towel can be placed on the bottom of the DO calibration container). Loosely fit the probe into the calibration beaker to prevent the escape of moisture. *Be sure not to get your DO sensor wet as the evaporation of moisture on the temperature sensor or DO probe may influence the readings during calibration. Allow the container to become saturated with water vapor (approximately 10 to 15 minutes). *During this time, turn on the instrument to allow the DO probe to warm-up. Fill a calibration beaker enough 0% DO solution to cover the electrode junction (about 75 mL in a 100 mL beaker). Immerse the DO sensor into the solution. The calibration is complete. Rinse the probe with deionized water and store the probe according to manufacturer’s instructions. *Be sure to rinse off all of the 0% DO solution so as not to effect the measurement of environmental samples. At its simplest form, turbidity is just the cloudiness of water. The cloudiness typically comes from particles that are suspended in the water that we can’t see individually. These particles could be algae, dirt, minerals, proteins, oils, or even bacteria. Turbidity is an optical measurement that indicates the presence of suspended particles. It's measured by shining light through a sample, and quantifying the suspended particle concentration. The more particles that are in a solution, the higher the turbidity. It’s important to note that while turbidity correlates with suspended solids, measuring turbidity is not the same as measuring total suspended solids (TSS). TSS measurements are gravimetric, which quantifies the mass of the solids suspended in a sample, performed by weighing the separated solids. Why is measuring turbidity important? Turbidity can contribute to the overall health and quality of a water body. If the water is comparatively clear, then aquatic organisms can benefit from the increased light in their photosynthetic activities. This increased photosynthesis helps increase the supply of oxygen in the water. Turbidity is an easy indicator of potential problems in water, since it can be measured visually as well as by quantitative means. If turbidity is high, it may be an early indicator of a number of potential contributing factors, such as increased nutrients like nitrate or phosphate, increased water temperature, or increased carbon dioxide levels. It may also indicate that man-made pollutants, such as agricultural runoff or industrial discharges, are having a negative impact on the clarity of the water. The diversity of biological life is diminished in turbid waters. Over time species will die, and the water will be occupied by only the organisms that have systems robust enough to survive in this environment. The overall water quality will continue to decrease in turbid waters, since the rate of photosynthesis will remain low. Increased turbidity can also provide particulate hosts for heavy metals and other toxins. How do we measure turbidity? One way to measure turbidity is using a Secchi disk. A Secchi disk provides an indication of the maximum depth at which plant life can grow by identifying the depth where light no longer penetrates the water. Photosynthesis cannot take place without light, so plants will not grow at depths below the level where the Secchi disk is visible when immersed. Because Secchi disk measurements are based upon the disk being lowered until it disappears, it cannot be used in rivers which are shallow or have low turbidity. Secchi disk readings vary seasonally with changes in photosynthesis and therefore, algal growth. In most lakes, Secchi disk readings begin to decrease in the spring, with warmer temperature and increased growth, and continue decreasing until algal growth peaks in the summer. As cooler weather sets in and growth decreases, Secchi disk readings increase again. Rainstorms also may affect readings. Erosion from rainfall, runoff, and high stream velocities may result in higher concentrations of suspended particles in inflowing streams and therefore decreases in Secchi disk readings occur. On the other hand, temperature and volume of the incoming water may be sufficient to dilute the lake with cooler, clearer water and reduce algal growth rates. Both clearer water and lower growth rates would result in increased Secchi disk readings. A more precise way to measure turbidity is through the use of a turbidity meter. Turbidity meter operate by passing a beam of infrared light through a vial containing the sample to be tested. A sensor detects the amount of light scattered by the undissolved particles present in the sample. A microprocessor then converts the readings into nephelometric turbidity units (NTUs). Calibration is simple with the use of commercially available polymer primary standards (AMCO-AEPA-1). These pre-made standards are preferred but standards can be prepared using Formazin according to the EPA analytical Method 180.1. The cuvettes should be free of scratches or cracks and always handle the cuvette by touching only the cap or its top side so as not to dirty it. Any cuvette with visible scratches will be discarded. *If formazin standards are used, mix the cuvettes gently for about 1 minute and then allow the standard to settle for one more minute before calibration. Insert and calibrate the meter using a <0.1 NTU standard. Select a the next standard and calibrate or verify the calibration if instrument will not accept a second standard. Repeat as needed until the meter is fully calibrated. How can Hanna help with your water quality testing? 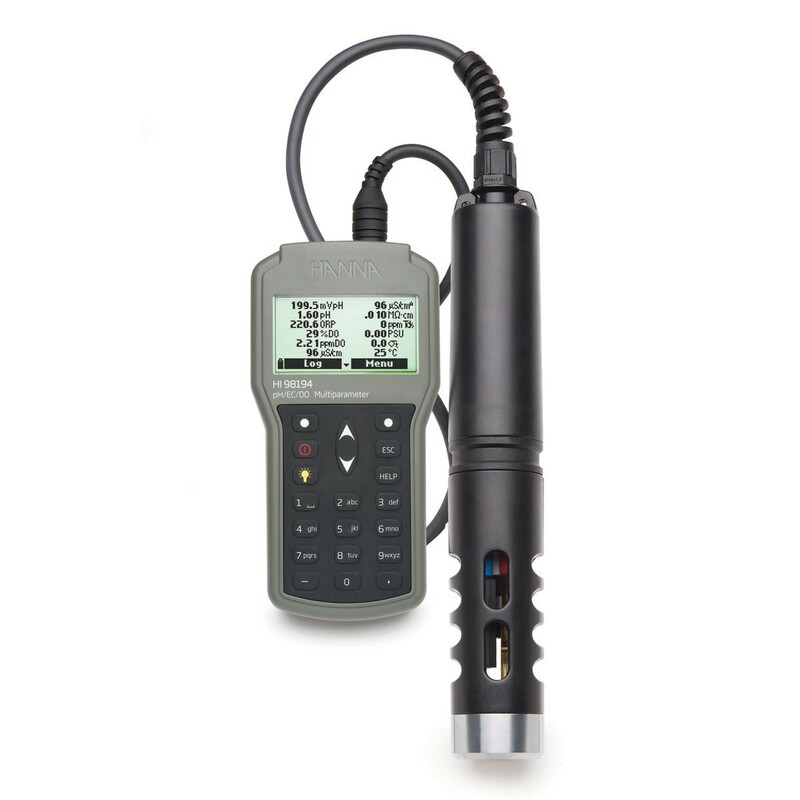 The HI98194 is a rugged, portable pH, ORP, conductivity, dissolved oxygen, and temperature field meter with the performance and features of a laboratory-grade meter. GLP Data - HI98194 includes a GLP feature that allows users to view calibration data and calibration expiration information at the touch of a key. Calibration data includes date, time, buffers/standards used for calibration, and slope characteristics. The HI98194 makes professional measurements easy in the field by supplying everything you need in a rugged carrying case. Available in pH/EC HI98195 or pH/DO HI98196. Need more power? The HI9829 is the ideal multiparameter meter with optional GPS for water quality professionals. The HI9829 monitors up to 14 water quality parameters using a multi-sensor probe. Parameters include pH, ORP, electrical conductivity (EC), dissolved oxygen (DO), turbidity, ammonium, chloride, nitrate, and temperature. Tiffany graduated from The University of Rhode Island with a degree in biology and wildlife conservation. 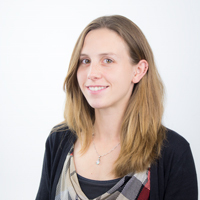 With a history of environmental and medical research, she uses her technical knowledge to write content for Hanna Instruments. Tiffany may be reached at tfredette@hannainst.com.